I'll admit that I bought into the hype that came with the announcement of a women's hockey league that was to pay its players. 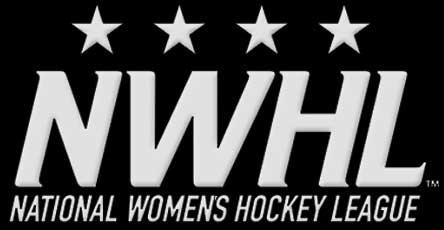 The NWHL arrived with the fanfare that the WHA did when it decided to kick the door in, and the CWHL, acting like the NHL, reacted like it was no big deal. There was a kick-off event with US Olympians and some press, and things looked like they might be ramping up for the upstart league. Everything being said by Commissioner Dani Rylan sounded like the NWHL was out for CWHL blood with the promise of pay and becoming the place where elite players would play, but with the calendar turning to August that promise seems to be running a little thin with regard to the stars that were to be delivered. That's not to say there aren't recognizable names on rosters at this point. Brianne McLaughlin was on the US Olympic team in Sochi in 2014, and she'll be suiting up for the Buffalo Beauts. Janine Weber, formerly of the CWHL's Boston Blades, signed with the New York Riveters, and she's best known for her Clarkson Cup-winning overtime goal last season. Madison Packer, Emily Field, and Jillian Dempsey are names that you should know if you're following the collegiate game as well, but there seems to be a distinct lack of star power in the NWHL. Much like the WHA during its start, being an upstart hockey league with the promise of paying players more than they've seen in "that other league" means nothing unless they can land a major star. It took the WHA's owners banding together and driving a dump truck of money down to Portage and Main in Winnipeg to get Bobby Hull - arguably the biggest star in the NHL at the time - to sign with Winnipeg. With Hull signing, however, the influx of NHL stars followed soon after as players like Gerry Cheevers, Derek Sanderson, and Bernie Parent made the jump to the WHA. The NWHL may have to make the same kind of push if they're going to gain some legitimacy on the CWHL in terms of star players. As of right now, there aren't a lot of faces that the average American fan is going to recognize. Names like Hilary Knight, Brianna Decker, Jessie Vetter, Kendall Coyne, and Kacey Bellamy are still unsigned, and these players should bring immediate legitimacy to the league if the NWHL can get them to sign. If not, the NWHL may go through a lot of programs at games this season. It was a foregone conclusion that many of the Canadian Olympians and recognizable stars would remain with their respective CWHL clubs, but the Boston Blades was the one CWHL team where things could change dramatically thanks to the Boston Pride rivaling them for players and fans. The Blades are stocking the NWHL with players in a way as all of the players who were relegated to less-than-regulars are jumping ship. The aforementioned Janine Weber along with Corinne Buie, Kelly Cooke, Jess Koizumi, and Alyssa Gagliardi have already signed with NWHL teams while players like Casey Pickett and Denna Laing skated in Boston's edition of the NWHL tryout camps. While I fault none of the players above for going and finding more playing time than the third line on the CWHL's Boston Blades, players and American Olympians like Knight, Decker, Meghan Duggan, and the Lamoureux twins remain uncommitted to any NWHL team where their presence is needed. Like Hull did for the WHA in legitimizing the league, any of these players - or any others who are recognizable by name - signing in the NWHL would, in theory, kick-start the signings of other notable players. The question, therefore, should be asked if the owners of the respective NWHL teams should band together like the owners in the WHA did, throw a pile of money into a pot in order to sign a major player like the WHA did for Bobby Hull, and bring on a Hilary Knight and a Brianna Decker to help the entire league gain a foothold. As much as this sounds like a terrible business idea for the four NWHL owners, it's not so far-fetched when you consider that one of the NCAA's best players in Marie-Philip Poulin went home to Montreal to play with the CWHL's Stars rather than grabbing a paid roster spot in the NWHL. Poulin was a household name in Boston, and she would instantly make Boston better. The same can be said for any of the American Olympians who are household names across the United States, yet there hasn't been one big-name player signing by the NWHL. While I have no issues with any of the women signed as they all have made their respective teams on merit, the NWHL is turning into a second-tier women's league with a few lesser-known players from elite Division-I NCAA schools and a pile of players from lesser-known programs in the northeastern United States. The marketing and message of the NWHL at the start of their campaign was to have the best players playing in the NWHL. So far, they're falling short on the delivery of that promise. As it stands, the NWHL is giving a pile of women a chance to play hockey for money, but I'm not sure they're going to build rabid fanbases without some of the elite women hockey stars. They need to make a splash to give the league some legitimacy as well as giving the fans a reason to come and watch these games. In saying that, it might be time to tear a page from the history books for the NWHL and try something that worked for one upstart league for a while. Otherwise, their history may be shorter than the WHA's history. The Hockey Show, Canada's only campus-produced hockey radio show, is starting to get geared up for the hockey season! Part of getting ready is knowing your opponents and we're proud, honoured, and privileged to feature a guy who has scored a pile of AHL goals and who will be coming to town to try to derail the Manitoba Moose's efforts to make the 2016 Calder Cup Playoffs. He's played in a bunch of big games, moved a few times only to find himself back where he started, and we're thrilled to have him join us on The Hockey Show tonight! Ladies and gentlemen, we are proud to bring to you the man to the left who is under contract with the Carolina Hurricanes and Charlotte Checkers! 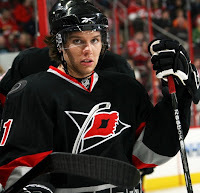 Mr. Zach Boychuk will join us on The Hockey Show tonight as we get to know a division rival's sniper! He's won the Willie Marshall Award once for leading the AHL in scoring, and he's been a part of some incredible Team Canada rosters that are responsible for a pile of gold in this country! We're going to talk to Zach about growing up in Airdrie, Alberta, his time with the WHL's Lethbridge Hurricanes, being drafted 14th overall by the Carolina Hurricanes, spending time in Albany, Charlotte, Raleigh, Pittsburgh, and Nashville, and a pile of other stuff that Zach's done in his ten-year career thus far. Of course, we also like to toss some softball-type questions at our guests, and Zach will get no special treatment. 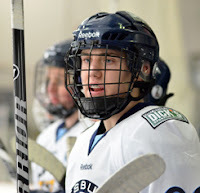 We may ask him about his favorite TV show, his favorite movie, his pregame meal choices, the last song he listened to on his iPod or in his car, what he'd be doing if he wasn't playing hockey, favorite NHL player(s) growing up, and much more. It's going to be fun to learn about one of the Moose's top opponents this year! The phones will be closed with Zach Boychuk joining us by phone. To hear this great interview, tune in tonight on 101.5 UMFM on your radio dial in the Winnipeg region or you can listen live between 5:30pm and 6:30pm CT on your web-enabled device at the UMFM webpage! You can tweet me anytime you like by hitting me up at @TeebzHBIC on Twitter. You can also post some stuff to Facebook if you use the "Like" feature, and I always have crazy stuff posted there that doesn't make it to the blog or show. 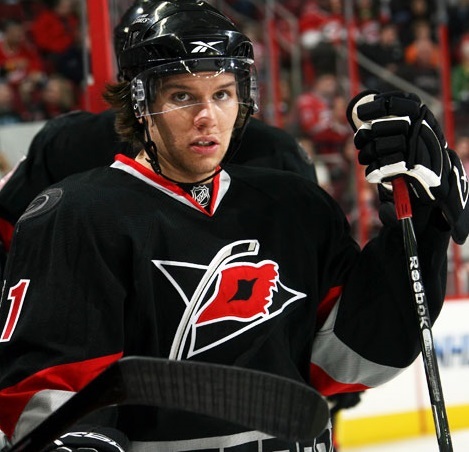 We're excited to have Carolina Hurricane Zach Boychuk join us tonight only on The Hockey Show on 101.5 UMFM! We've reached the thirteenth entry in the Antler Banter series, so all of you have a phobia of thirteen - triskaidekaphobia - might want to avoid this article. Of course, I kid about that as I've surpassed a number thirteen-related entries, but we'll look at another full entry with no Moose news as the team sits quietly. There was a coach hired in one city, new uniforms debuted in another city, an unintentional jersey unveiling for another team, and signings continue to dominate the headlines in the AHL. We'll look at a number of these stories tonight as we build towards the Manitoba Moose's first season back in Winnipeg despite there being very little action on the Herd's front. Let's get rolling with another edition of Antler Banter! He may not be Kotter, but the Rochester Americans brought back a very familiar face in Randy Cunneyworth who has lived in the new York city for the past 31 years! Cunneyworth was the head coach of the Americans for eight years, spanning 2001 until 2008, twice winning division titles, thrice surpassing the 40-win mark, and was named the AHL's top bench boss in 2004-05. Cunneyworth has done a lot of that in his career - 350 wins to date that saw him behind the benches of Rochester and Hamilton with 306 of those wins coming with Rochester. That puts Cunneyworth eighth all-time in wins in the AHL, and he should be able to add to that total this season with some of the great young players the Sabres have drafted. Of course, with the Americans celebrating their 60th anniversary this season, the former Amerks player and coach feels there's a chance to do something special this season. "Terry (Pegula) believes in the heritage of the Buffalo Sabres and the Rochester Americans," Cunneyworth said. He will have his work cut out for him, though, as the Amerks were 29-41-5-1 last season, finishing 14th of 15 teams in the Western Conference. While the playoffs will be the goal this season, Cunneyworth will have his work cut out for him. In saying that, the Sabres and Amerks hired an excellent teacher and coach, and we should see improvements from the Amerks this season in the standings. Playoffs? Maybe. It's not out of reach for a Cunneyworth-coached team. 22 year-old Sven Baertschi will be back with the Canucks after being acquired last season as the trade deadline. The Canucks announced on Tuesday that they had re-signed the Swiss forward after he had a pretty solid Utica Comets debut last season. Baertschi was a point-per-game player through fifteen regular season games with the Comets after posting seven goals and eight assists, and then added another fifteen points in 21 playoff games. The surprising part of the deal was that it was a one-year, one-way deal for $900,000 in what some are saying is a "show us" deal. Baertschi, a former first-round pick by the Calgary Flames, has had solid AHL numbers, but is production falls off in the NHL where he's recorded just ten goals and 20 assists in 69 career games including two goals in three games with the Canucks last season. 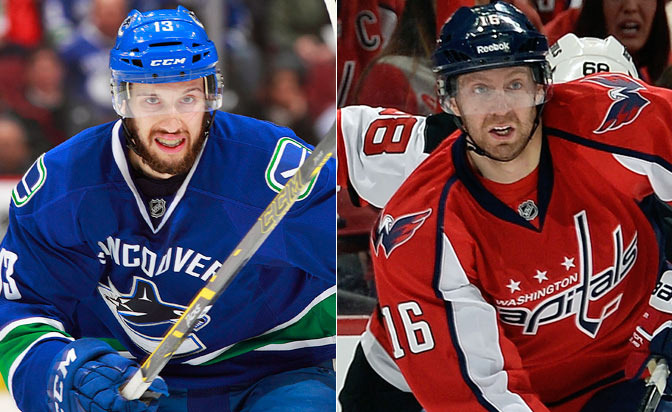 With the addition of Brandon Sutter this week by the Canucks, Baertschi is going to have to make an impact in camp in order to grab a top-six role. We'll see how his summer work has fared once camp breaks, but this could be the last chance Baertschi gets to crack an NHL roster for a while. He's suited up for the Hershey Bears. He's played with the Wilkes-Barre/Scranton Penguins. And now he'll be taking his services to the Lehigh Valley Phantoms. Chris Connor signed with the Flyers back on July 1 to complete the three-Pennsylvania-city feat, and the Flyers are getting themselves a solid AHL veteran who has a ton of experience under his belt. "It was one of those things where it was nice to get a two-year offer," Conner told The Patriot-News's Tim Leone today. "From what I was told, there would be a good opportunity for me to play some games up [in the NHL]. It's just a good opportunity for me." The two-year, two-way deal should bode well for Connor with the number of changes the Flyers seem to be making. Connor has 180 NHL games to his name where he's scored 22 goals and 28 assists, but he is familiar with Flyers head coach Dave Hakstol having played against Hakstol's North Dakota teams while he was attending school at Michigan Tech. I liked Connor with Pittsburgh, and he should be able to provide some great bottom-six depth for the Flyers. After five different AHL teams in the last five years, I'm betting that this deal from Philadelphia for Connor will see him work his tail off to make the Flyers and Phantoms better. 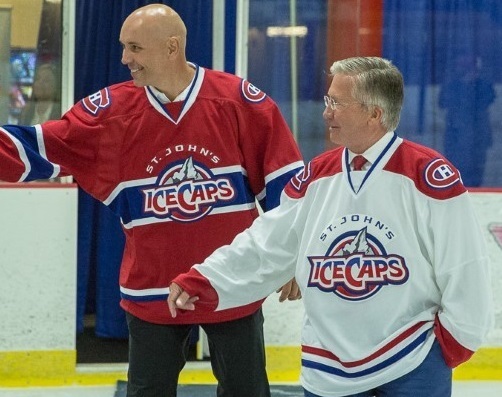 The St. John's IceCaps followed suit with most other teams by adopting their NHL affiliate's look for their uniforms. The traditional bleu-blanc-et-rouge worn by the Canadiens will have the redder IceCaps logo added to the chest of the uniforms as the IceCaps begin play as the Canadiens' affiliate next season. Like the Jets did before the Canadiens came to town, there is no identity for the IceCaps as a team thanks to them buying into the NHL Look-Alike Contest. 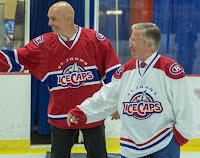 Rather coincidentally, the two men modeling the jerseys are IceCaps President and CEO Danny Williams and IceCaps head coach Sylvain Lefebvre! If Lefebvre's name sounds familiar, he is the former NHL defenceman who played with Montreal, Toronto, Quebec, Colorado, and the New York Rangers. He is also the man who was behind the bench for the Hamilton Bulldogs before the franchise transferred to Newfoundland, and he'll assume the same position with the IceCaps. The new uniforms are nice, but I'd like to see AHL teams adopt heir own identity. While I get that wearing the colors of the NHL team is the ultimate goal for all of the players on each respective AHL affiliate, giving them NHL colors in the AHL makes those colors less significant. I know EA Sports is the be-all and end-all in the sports video gaming world, but occasionally they get a little too enthusiastic. Case in point? The image to the right is from the NHL '16 trailer put out by EA Sports on Tuesday. The Gulls, however, have been closely guarding their uniform design until later this summer when there was to be a major unveiling of the Gulls' new threads. It's never a good thing to upend one of your clients, but leaks happen occasionally. Oops! The good news? 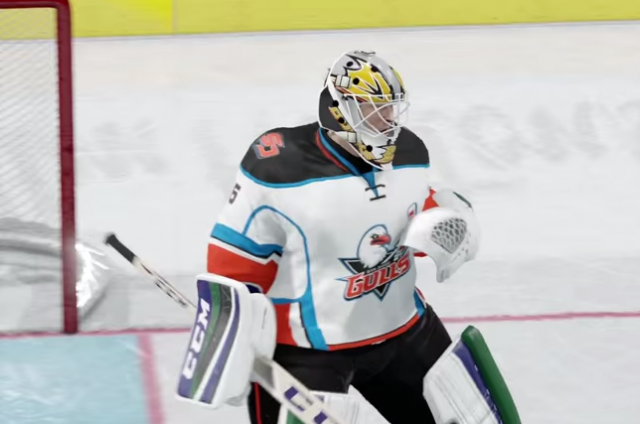 It's definitely in the game since the Gulls didn't refute the jersey shown. That's all I've got for today in Antler Banter regarding some of the larger stories out of the AHL. The Moose make their home debut on Thursday, October 15 with a schedule release sometime in mid-August for the remaining 75 games on the schedule. Will you be there? Mini-packs and season tickets are still available! If you're looking for a contact within the Moose to get tickets, let me know and I can hook you up with some awesome people! The Pittsburgh Penguins were busy on Tuesday as they solidified a rather weak third-line via trade and free agency. The Penguins made a deal with the Vancouver Canucks to send Brandon Sutter and a 2016 third-round pick which originally belonged to Vancouver to the Canucks for Nick Bonino, Adam Clendening, and a 2016 second-round draft pick in a rather unsurprising move, and then announced they had signed former Capital Eric Fehr to a three-year, $6 million deal. While no one will say that the Penguins have the best third-line in hockey by any means, they solved their "Brandon Sutter" problem while bringing in two guys who make that line better. The stakes were high when the Penguins dealt Jordan Staal to the Carolina Hurricanes for Brandon Sutter, and they felt that Sutter could replace Staal while being a cheaper option down the middle. While Sutter was an excellent penalty killer and checking forward, the offensive flair that the Penguins wanted was never found. The Penguins certainly used Sutter to make their team better, but his impending free agency and potential big payday made the once-vital centerman expendable in an era where two-way players have to contribute offensively. So he's off to Vancouver in exchange for a centerman who can score, a defensive prospect who looks like he may have a shot at an NHL job, and a pick that the Penguins desperately need after dealing away every first-round pick until 2076 (I kid, of course). The Penguins are already fairly deep down the middle, but there is a definite need to get more offence out of their third and fourth lines. Players like Marcel Goc, Zach Sill, Daniel Winnik, Craig Adams, and Maxim Lapierre did little to bolster the top two lines in Pittsburgh, and there's a good chance that Bonino, Fehr, and the re-signed Beau Bennett form the third line. There's vast potential there, but I'd be careless not to suggest that potential has to be realized. Bonino is an American centerman who has played with the USA National Team at the 2015 World Championships where he put up two goals and two assists in ten games. He has a solid season with the Canucks last year, and put up career numbers with Anaheim the year before. Bonino isn't going to win you a scoring championship, but he has a nose for the net and has proven he can finish at the NHL level. While the Penguins will miss Sutter in his penalty-killing role, Bonino can kill penalties as well. In terms of effectiveness, we'll see how close he gets to Sutter in terms of his defensive game. The other guy the Penguins added for a tidy sum today was Eric Fehr. Fehr hasn't done any significant scoring outside Washington, DC, so it will be interesting to see what happens in Pittsburgh. There's a train of thought that because he wasn't playing with the same type of offensive players in Winnipeg as he was in Washington that his stats plummeted hard. This may be the case or it could be because he was often injured, but whatever it was in Winnipeg wasn't the same in Washington. He's been a consistent 30-point player with the Capitals, and it's that kind of production that the Penguins sorely need from their bottom-six. Playing with a guy like Bonino who's a pretty decent passer should help as long as Fehr does the little things right like going to the net and finding openings. It seems that the depth of the Penguins has improved greatly with these two moves while not adding a big chunk of salary. From a stats perspective, it seems the Penguins are pleased with the additions despite the subtraction. "The analytics are very strong on both Nick Bonino and Eric Fehr in all the aspects of what we look for in analytics," Penguins GM Jim Rutherford said. "Fehr is comfortable as a two position player. He could definitely jump up to the top-6 if the situation presented itself. Bonino's strongest position is center. That would be his preference." While he's not scheduled to appear on the third line whatsoever, Adam Clendening might be the diamond in the rough in the Vancouver trade. He's a solid offensive defenceman who has really honed his game since leaving Boston University. He was excellent with the Rockford IceHogs from 2012-14 when he posted 105 points in 147 AHL games. He's generally viewed as needing to be grittier in his own zone, but I'm not sure that offensive defencemen have ever been gritty. For Clendening to take the next step, he has to use his rather under-used shot from the point. He's great at reading plays and jumping up where needed, but his shot should be featured as part of his skill set. If he can crack the Penguins line-up, expect him to be in a three/four role and see time on the power-play. He could very well be the second unit's Kris Letang with his offensive ability. Overall, for a team that desperately needed to improve in relation to the moves made by other teams in the Metropolitan Division, the Penguins have done the best they can with the miniscule salary space they have. In this writer's view, they certainly didn't take a step back. Tyler Seguin. Michael Del Zotto. St. John's Shamrocks. Seann William Scott. Doug Glatt. Halifax Mooseheads. Can you tell I'm excited for Goon: Last of the Enforcers? I loved the first film and still have a few props from the movie kicking around HBIC Headquarters, but this second film sounds like it's going to be even crazier. "Other NHL appearances are coming, Baruchel allows, but they're top secret. 'Habs?' we ask. 'Uh, uh… let’s say there might be some former. But I'm not giving anything away.'" Might we see a Chris Nilan appearance? It would be cool to see a Vincent Damphousse or someone else drop in there as well. "The Eastern Maritime Hockey League becomes a refuge for top-tier pros in Last of the Enforcers as a lockout brings an influx of goons, namely antagonist Anders Cain, into the league of an aging, married Doug Glatt — our hero, reprised by Seann William Scott." So this is the plot of the first Goon movie with Scott taking Liev Schreiber's role? Everyone is out gunning for a shot at the toughest hombre in the league? "'There's way more blood and way more violence than in the first one,' promises Scott." That should make parents of teens who want to see the second version of Goon feel better about the film. Having looked the film up on IMDB, I can tell you that Ross Rhea (Liev Schreiber), Halifax head coach Ronnie Hortense (Kim Coates), Eva (Alison Pill), Ira Glatt (David Paetkau), Halifax teammate Marco Belchior (Jonathan Cherry), and Mrs. Glatt (Ellen David) all return from the first movie. Baruchel has added Popular Mechanics for Kids co-star Elisha Cuthbert and She's Outta My League co-star TJ Miller to the cast as well. In other words, this movie has brought back all of the elements that made the first movie so good while adding some solid talent in Cuthbert and Miller. I can only hope the script is as good as it was in the first movie. The one omission I noted on that cast list? Eugene Levy who played Dr. Glatt, Doug's father. If Mr. Baruchel couldn't get Dr. Glatt back in this movie, I feel he might be missing a great piece of the cast. I know that when Goon filmed locally here, Eugene Levy was one of the cast members that the arena staff couldn't say enough about in terms of how nice he was to everyone and how generous he was with his time when it came to signing autographs and taking pictures. I'd love to see him back in this sequel. 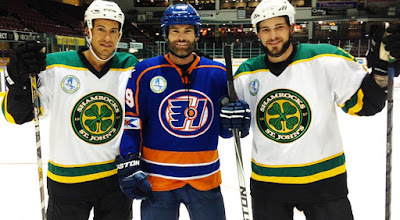 In any case, the cast and crew are 23 days into shooting Goon: Last of the Enforcers, and I'm pumped for the 2016 release. Doug Glatt is back on the ice! It was expected that the Ottawa Senators were taking a bit of a loss when they traded Jason Spezza to Dallas for Alex Chiasson, but I'm not sure that a 26-point season was the return they were expecting. Chiasson was supposed to provide some immediate scoring on the wing for the Senators, but he didn't really pan out in terms of being the scorer they needed. While he was effective at using his body along the boards, finding the back of the net was more of a challenge. It was expected that Chiasson would ask for a raise upon becoming a restricted free agent, but asking for one and deserving one are two completely different things. I'm not one for calling out bloggers who do work for specific teams, but the garbage I read today over at a certain site regarding Chiasson's play last season is beyond laughable. Chiasson earned $900,000 for his play last season, and was awarded a $1.2 million, one-year contract by an arbitrator this season. While a modest $300,000 raise is fine by most salary cap standards, I'm not sure that Chiasson deserved a raise based on his lackluster stats and rather indifferent play. "Last season, Chiasson was instrumental on the power play, scoring three goals and adding three helpers, while using his 6′ 4, 205-pound frame to his advantage, dishing out a career-high 93 hits." How three goals and three assists on the power-play makes one "instrumental" is beyond me. He was ninth-best on his own team in power-play points - one better than "defensive MVP" Patrick Wiercioch - and four points back of Clarke MacArthur who played 14 fewer games than Chiasson. To make matters worse, the writer above dropped this gem of a line in writing, "... he brings just as much to the table as the aforementioned Ryan and Hoffman" in his article. Yes, the 26-point Chiasson brings as much to the table as the 54-point Bobby Ryan and 48-point Mike Hoffman. This comparison is beyond insane. How is that Chiasson can average one minute less per game than Mike Hoffman yet finish 21 points fewer than Hoffman if they bring the same amount to the table? Could it be effort? Heart? Determination? The will to head into high-traffic areas? The sacrifice of giving up a puck to get it back? Any or all of the above? Let's be honest here in saying that the 25 year-old Chiasson has all the potential in the world to be a gamer. He could show up next season with a little more muscle and take some major steps forward in being the solid power forward the Senators need. The difference between potential and talent, though, is a wide gap, and it's up to Chiasson to close it. Asking for a raise when you've done little to justify said raise is pretty ballsy in a what-have-you-done-for-me-lately league. "In our opinion, both sides made fair, detailed arguments and we are satisfied with the ruling of the arbitrator," Senators general manager Bryan Murray said after the arbitrator's ruling. "We are happy to have Alex under contract and anticipate that he will be a productive player for us this season. Alex will be given the chance to have an important role in the team's success." Sounds like the ball is squarely in Chiasson's court to prove to the Senators that he's worth the money. There's no question that the Senators want him to become more of a regular scoring threat, and they were prepared to meet Chiasson's demands with an arbitrator's ruling. After all, when a writer who is signing your praises writes just below that Chiasson "... will also have room to improve his defensive game which admittedly needs work," chances are you aren't a very strong player at the NHL level, especially when Ottawa needs a very good defensive game in the division they play. But when writing statements such as Chiasson's "tireless contributions and tremendous potential will definitely be something that the Ottawa Senators can take to the bank", you have to wonder if people are watching the game at all. If 26 points are "tireless contributions", there should be a number of overpaid players in the NHL. And all the "tremendous potential" and a loonie will still only get you a cup of coffee. It's the realization of that potential that makes players rich. You can take that to the bank instead if you're looking to yield a payoff. Alexander Semin's time in Carolina was cut short by three years after the Hurricanes decided they had seen enough of his disappearing act. It wasn't surprising considering his six-goal performance last season, and it's being very apparent that he was the beneficiary of a system in Washington that prided themselves on offence. Never scoring less that 21 goals per season in his six seasons with the Capitals, he eclipsed 21 goals only once in three seasons in Carolina in 2013-14 when he notched 22. After signing a contract with the Montreal Canadiens, one has to wonder which Semin is going to show up this season. Never mind the fact that Michel Therrien won't stand for his disappearing act, but the Canadiens will expect him to work hard, back-check like a demon, and play defensively sound hockey. Montreal is a defence-first team that has some offensive stars, but they're probably not going to have an Art Ross Trophy winner on their roster any time soon. While adding a former firty-goal scorer to the lineup is fantastic on most accounts, Semin is six seasons removed from that year and hasn't broken thirty goals since. It's going to be difficult to see him potting forty this season based on how Montreal plays as well. However, if Semin plays like he did in the following video night-in and night-out, everyone will welcome him with open arms. Giveaway at the blue line aside, that's some solid hustle. The problem is that Semin doesn't often give that kind of effort. Plugging Semin into the roster spot vacated by PA Parenteau will be interesting considering the one major complaint about the Canadiens is their lack of size up front. Semin is listed at 6'2" tall, but plays like he's 5'9". He's seems somewhat allergic to the corners of the rink, he doesn't throw the body all that much, and driving to the net is a phrase Semin hasn't quite figured out yet. For a guy listed at 6'2" and 210 pounds, he needs to play more like a Max Pacioretty if he wants to succeed in Montreal. Heck, let him work this summer with Brendan Gallagher on how to fight one's way to the net. While his $1.1 million contract will allow for the Canadiens to bury him in the minors if things go sideways, his cap hit won't sink the team if Therrien uses his healthy scratch option on him. Semin is near the league minimum for salary and he's working on a one-year contract, so there's plenty of motivation for him to play as hard as he can. He admittedly stated in his press conference and, depending on how this season goes, it may have been the beginning of the end for the 31 year-old. Hurricanes GM Ron Francis cited competitiveness as a reason for waiving Semin while head coach Bill Peters scratched him due to conditioning on occasion. Those are the kinds of marks on a player that can kill a career. "Alex is a pure goal-scorer with a good shot," general manager Marc Bergevin said in a statement. "We believe his addition to our group of forwards will strengthen our offensive production and our power play. A veteran winger with size, Semin has reached the 20-goal plateau seven times since the beginning of his NHL career 12 years ago. His signing represents a great opportunity for the organization and for Alex's career." The last part about the opportunity for his career has probably never been truer. Semin's on a thin thread in terms of staying in the NHL, and he'll have to show everyone that he still has the hustle and drive that made him one of the league's best goal scorers in Washington. Otherwise, no team will take a chance on him next season. According to Wikipedia, a capital expenditure "is incurred when a business spends money either to buy fixed assets or to add to the value of an existing fixed asset with a useful life extending beyond the taxable year." If one were looking at Braden Holtby's new contract, I'd say that the Capitals spending money on their asset for the next five years is a wise investment. Holtby and the Washington Capitals avoided arbitration by agreeing to a five-year deal worth $30.5 million as the Capitals locked down their goaltending for the immediate future. Holtby certainly proved his worth last season after posting a record of 41-20-10 with a 2.22 GAA and a .923 save percentage. He was a major reason why the Capitals went from a wild card team to a legitimate playoff team, and his work in the series over the Islanders can't be overlooked. Holtby really has solidified a position that had been shaky over the years for the Capitals, and he supplanted both Michal Neuvirth and Semyon Varlamov after those two netminders were expected to rise to the occasion. The salary commitment by the Capitals is a little unorthodox, though, as Holtby will receive $3.5 million plus $3M bonus this year, two years at $7 million, and two more at $5 million. I'm not sure a signing bonus was necessary, but the average cap hit of $5.1 million isn't terrible, and he'll be 30 years-old when the five-year deal expires which gives both Holtby and the Capitals some options at that time. There will be questions as to whether Holtby is the netminder that can lead the Capitals to the promised land, but he had better regular-season stats than both Ben Bishop and Corey Crawford, and they played for the Stanley Cup. He tied for second in wins with 41, fifth in GAA and save percentage, and was tied for second in total shutouts for the season. There aren't many goalies with those kinds of numbers who are being paid less than Holtby, so it's now on Holtby's shoulders to continue to deliver those kinds of numbers. "Since Day One I've wanted to be the guy in the Washington Capitals net, since I got drafted by them," Holtby told Katie Brown of NHL.com. "It doesn't change. I'm just happy to have the opportunity, and like in the past I know I still have to prove it." Clearly, he had a great season, finishing fourth in Vezina Trophy voting, but he set a number of career-bests last season while tying a number of Capitals franchise records. 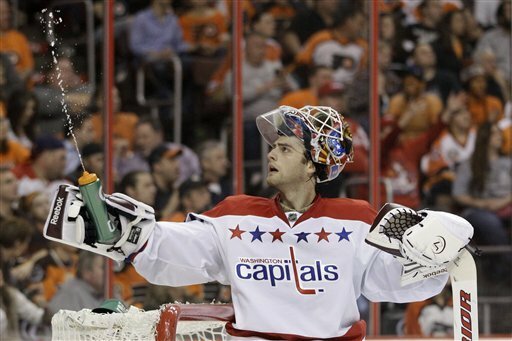 "My goal has always been to win as many games as possible and work toward that goal of a Stanley Cup," Holtby said. "Obviously, we fell short, so we know we need to get better - myself, our group - and I think we're doing the right things to do that. I try and focus on my job to win games and accomplish the main goal." The Capitals have given Holtby 30.5 million reasons to continue to improve and win as many games. There is still the outstanding arbitration hearing for Marcus Johansson who also set career highs in goals, assists, and points last season, but, unlike Holtby, there has been little movement on that front from either side. Holtby, though, solidifies the defensive zone considerably with this signing, and I expect him to continue to provide above-average goaltending going forward. Especially in an always-improving Metropolitan Division. The Hockey Show, Canada's only campus-produced hockey radio show, is back for another episode of fun-filled craziness, possibly some prize giveaways, and the return of someone whom we've been hunting for some time now! Ok, so maybe "hunting" isn't the right word, but we, along with many fans, have been wondering about the whereabouts of a certain third-(wo)man-in who has been absent for the summer. All of this and more on tonight's episode of The Hockey Show! We've tracked her down, brought her back, and she'll be in the studio tonight as Columbus makes her return to The Hockey Show! We'll catch up with Miss America on what she's been doing in the good ol' USofA, and we're going to run her through the tasks as our resident fashion police after the NHL debuted new looks at the NHL Entry Draft and the Milwaukee Admirals changed their look. Heck, there might even be something waiting for her tonight at the studio as a "welcome back" gift! 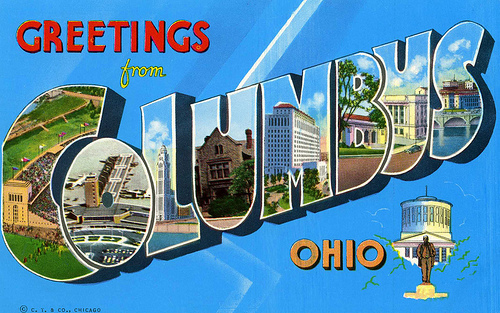 In between the festivities, the three of us will talk about the two expansion team bids, why there weren't more bids submitted, Columbus has a news story to update (see? We put her back to work as our intrepid reporter), Amanda Kessel calling it quits for a college hockey career and what that means for the NCAA and USA Hockey going forward, and much more. Of course, your calls and tweets are welcome, so get those in tonight! The phones will be wide open and we we'll be awaiting your calls on all things hockey! Hit us up at 204-269-8636! Join us tonight on 101.5 UMFM on your radio dial in the Winnipeg region or you can listen live between 5:30pm and 6:30pm CT on your web-enabled device at the UMFM webpage! You can tweet me anytime you like by hitting me up at @TeebzHBIC on Twitter. You can also post some stuff to Facebook if you use the "Like" feature, and I always have crazy stuff posted there that doesn't make it to the blog or show. We welcome back the one and only Columbus tonight, and that happens only on The Hockey Show on 101.5 UMFM! Antler Banter returns for its twelfth installment and it's starting to become a little repetitive over at the Manitoba Moose website where nothing has changed since the site debuted when the return of the Moose was announced. The Moose have signed players and should be getting fans ready with some highlights of players who are returning this season, but there hasn't been a single update to the website for nearly three months. If you wonder why Antler Banter is covering everyone else except the Moose, there's your reason why. Instead, we'll run down the AHL news and some signings like we always do as we wait for the Moose to break their holding pattern. In saying that, on with the show! The Colorado Avalanche signed Mikhail Grigorenko to a one-year deal on Friday following his trade to Denver from the Buffalo Sabres. Grigorenko played with both Buffalo and the Rochester Americans last season, and he could see time with the Avalanche this season after being reunited with his junior coach in Patrick Roy. The 12th-overall pick in the 2012 NHL Entry Draft has played 52 games in the AHL with the Americans, tallying 14 goals and 26 assists. In his 43 NHL games with the Sabres, he's posted three goals and three assists. While many see Grigorenko as having high potential, there are questions about his skating and work ethic from his Buffalo days. However, he was an exceptional player under Roy's watchful eye in the QMJHL, so we may see Grigorenko turn the corner this season. If he can't crack the lineup in Denver, though, expect him to do everything he can in San Antonio to get back with the Avalanche. Grigorenko likes Roy, and there's a feeling that his work ethic and effort level may rise to new heights this season. NHL defenceman Shane O'Brien, looking to continue his playing career, signed a one-year deal with the Anaheim Ducks on Friday. The 31 year-old spent most of last season with the San Antonio Rampage as part of the Florida Panthers organization, but he'll be given a shot to lead the Gulls and possibly find a spot on Anaheim's blue line. In 51 games with the Rampage last season, O'Brien had 11 goals and 19 assists for his best AHL totals since 2005-06 when he was a member of the Portland Pirates. After Portland, O'Brien spent time with the Lightning, Canucks, Predators, Avalanche, Flames, and Panthers. In 537 NHL games, O'Brien has 13 goals and 79 assists to go along with 916 PIMs. If nothing else, the Gulls are getting an NHL-ready defenceman who can help the young Ducks develop into true professionals. O'Brien's signing is a good depth pickup for the Ducks. The Washington Capitals announced on Friday that they had signed forward Zach Sill to a one-year, two-way contract. Sill spent time with Pittsburgh and Toronto last season, and was part of the deal that saw Daniel Winnik end up in Pittsburgh at the trade deadline. Playing mostly a fourth-line role with the Penguins, Sill has a goal and two assists in 42 games with Pittsburgh before being shipped to Toronto where he picked up another assist in 21 games with the Maple Leafs. He has 33 goals and 40 assists in 277 career AHL games, and Sill will make the Hershey Bears a much better team down the middle. Yann Sauve, a former Manitoba Moose defenceman, has inked a one-year deal with the Portland Pirates. Sauve spent time on three AHL rosters last season as he bounced around the continent, but he should find some comfort knowing he's got a good chance to be in Portland, Maine all season long. Sauve played in 17 games for the Springfield Falcons and four games each for the St. John's IceCaps and Providence Bruins in 2014-15, recording a total of one goal and three assists with his one goal coming with the St. John's IceCaps. Sauve has also had stops in Manitoba, Chicago, and Utica on his 221-game AHL career thus far, and he'll be anchoring a young Pirates blue line this season. The Utica Comets announced on Friday that they had re-signed forward Wacey Hamilton to a one-year deal. Hamilton had five goals and ten assists in 41 games last season, and helped the Comets reach the Calder Cup Final last season. Hamilton has spent time with the Binghamton Senators and the Utica Comets, playing 216 AHL games in his career that has seen him record 18 goals and 36 assists. Hamilton is a good depth signing for the Comets who will look to duplicate this past season's success. The Tampa Bay Lightning announced on Monday that they had re-signed forward Vladislav Namestnikov and defenseman Luke Witkowski to one-year, two-way contracts. Namestnikov skated with both the Lightning and Crunch last season while Witkowski had a cup of coffee with the Lightning. Namestnikov recorded nine goals and 16 points to go along with 13 penalty minutes in his 43 games with the Lightning while Witkowski picked up 15 penalty minutes in his 16 games with the NHL club. In Syracuse, Namestnikov recorded 14 goals and 21 assists while Witkowski had two goals and six assists. Namestnikov is closer to an NHL spot of the two skaters, but Witkowski is a rugged, shot-blocking defenceman and should see time with the Lightning again this season. Not that Teemu, readers. The Detroit Red Wings announced on Tuesday that they had re-signed Teemu Pulkkinen to a one-year deal. Pulkkinen was dominant in Grand Rapids last season, winning the Willie Marshall Award as the league's top goal-scorer with 34 goals in just 46 games while finishing tenth-overall in AHL scoring. The 23 year-old Finn should challenge for a roster spot in Detroit, but expect him to be lights-out for Grand Rapids if he somehow ends up back in the AHL. Pulkkinen should be a favorite for AHL MVP next season if he somehow finds himself down in Grand Rapids for more than half the season. Having seen him play a couple of times, Pulkkinen is the real deal. The Edmonton Oilers named the coaching staff for the Bakersfield Condors on Tuesday as Gerry Fleming was named head coach and Jean-Francois Houle and Tony Borgford were named as assistant coaches. Oilers assistant general manager Bill Scott will serve as the Condors' general manager while Josh Bennett was named as head athletic trainer, Al Oman was named as head equipment manager, and Patrick Love was named as head strength and conditioning coach. Fleming took over for Todd Nelson after his promotion to Edmonton, leading the Barons to the second-round of the Calder Cup Playoffs. He was an assistant coach in Springfield before joining the Barons as an assistant coach in 2010. He's also spent time with Fredericton and Quebec as part of the Montreal organization as well as coaching in the ECHL. Houle was Bakersfield's head coach last season, and will remain as part of the Condors family. Borgford was an assistant coach with the Barons last season and will move to California to continue his role with the club. "We are thrilled to announce our hockey operations staff, led by head coach Gerry Fleming, who will be a tremendous leader in Bakersfield," said Scott. "Gerry's attention to detail and ability to develop our young players made him a natural fit to return as head coach, By adding JF Houle as assistant coach and with the return of assistant coach Tony Borgford, we believe we have a tremendous coaching staff ready to take the Condors to the next level." That's all for today's Banter. 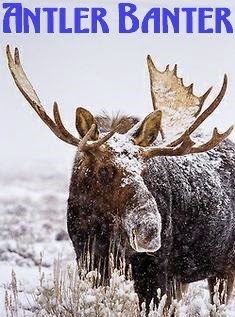 Let's hope that the Moose can do something - anything - in the next week to make Antler Banter a little more relevant to photo at the top. Non-Minnesota women's collegiate hockey fans can sleep a little sounder tonight as Minnesota's #8 will no longer haunt their dreams of a national college championship. It is with great sadness, though, that I'm reporting that Amanda Kessel will hang up her skates for the Golden Gophers after lingering concussion effects have put her playing career in serious doubt. The former Patty Kazmeier Award winner will sit out her senior year to allow her brain to heal in the hopes that she'll be able to return to play for the US National Team at some point in her career. "It's just not worth it for her and her health," Gophers head coach Brad Frost told the Grand Forks Herald. The 23 year-old sustained her concussion while with the US National Team, and hasn't been able to return to the ice for neither the Gophers or Team USA since suffering the concussion before the Sochi Olympics. While she did compete in the Olympics, the symptoms grew increasingly worse, keeping off the ice and, ultimately, forcing her to take a year off of school in order to recover from the injury. While Minnesota still won the NCAA Championship last year, the NCAA loses one of its most marketable stars while trying to sustain the sport's growth and popularity. Frost told Minneapolis' Star Tribune on Tuesday, "After her missing last year and the severity of the concussions last year, we had a feeling that she was not going to be able to play for us unless things turned around. We've had some discussions with Amanda and myself, but really, it's never even gotten to the point where hockey is something she would do with us again." Honestly, this is about as bad as it gets for women's hockey. This is akin to Sidney Crosby's sabbatical from the NHL after he sustained a major concussion where the league lost its most marketable star. Of course, the NHL didn't fall apart and neither will the NCAA under this news, but losing a player as dynamic and creative as Kessel has to come as a major blow when there are chances that the Gophers could repeat and have Kessel return in a somewhat fairy tale ending to her collegiate career. That, however, will not happen. "I've had an unforgettable experience at the University of Minnesota thus far, so I'm disappointed that I won't be able to return to the team this year," Kessel said in a statement. "It's obviously a difficult decision and one that I've taken time to come to terms with. As someone who has played through a lot of injuries, it wasn't until suffering a concussion that I fully understood the importance of being 100 percent healthy when I'm on the ice. Unfortunately, that isn't the case right now." I fully support and endorse Amanda Kessel for making this difficult decision. She has a long life ahead of her where she will make an impact, but she can't do it if she can't get out of bed in the morning because of concussion symptoms. Walking away from the sport you love is a reality a lot of athletes face, but few face it will in the prime of their lives and careers where championships and Olympic dreams are involved. The fact that Kessel has the strength to walk away at this point in her career shows her incredible strength and mental fortitude, and I commend her for not putting the potential short-term rewards ahead of her long-term health and happiness. Some players go their entire careers without any long-term injuries without ever winning a championship in their respective sports. Amanda Kessel has been named the best player in NCAA Women's Hockey and has won an NCAA Championship while being part of the NCAA's undefeated hockey team in history. Despite being just 23 years-old, she has accomplished more in her short time on the planet than some do in their entire lives. And she still has a ton of time to accomplish more. Amanda's decision today shouldn't be met with sadness. It should be embraced and celebrated. Rather than being held back by the crushing symptoms of a concussion, Amanda will be able to finish her college degree and continue being the best Amanda Kessel she can be. She may not be able to do that on the ice depending on how she feels, but the fact that she chose her long-term future over a shot at one more NCAA championship says a lot about the mind of Amanda Kessel and how clearly she is thinking. She'll always be a champion in my books. 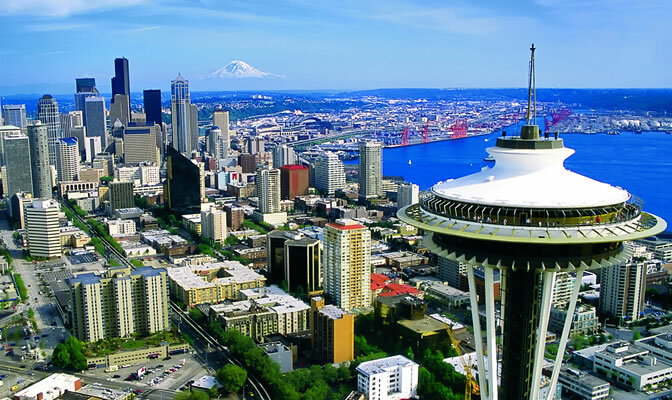 With the NHL expansion process underway, it appears the situation that Gary Bettman hoped to "bring some certainty to" will remain rather uncertain after it was announced that three separate groups from Seattle will not be submitting an expansion application to the NHL. While there still could be opportunities for these Seattle groups to jump into the expansion pool, it looks like they won't be in play for whenever the NHL feels the need to add teams in the immediate future. Seattle is still without an arena, though, so this is probably better for all than having these groups pushing head with an expansion plan. According to Bill Daly, the league will not consider any party who did not meet Monday’s hard deadline, so the timetable to get an arena in place suddenly doesn't become a time crunch had a group put the expansion process in motion. Having an NHL-ready arena is paramount to having an NHL team, so having one or more of these groups work on building an arena first now allows them to look at a long-term project plan that includes both an arena and an NHL team rather than having to play catch-up if an expansion bid was accepted. The other factor that may have had Seattle backing away from the expansion process is the $10 million application fee with the $2 million non-refundable price tag. With no arena in place, there was a good chance that the NHL rejected any plan that didn't include the building of an arena, and none of the three groups in the Seattle area have even broken ground on an arena. When you add another $400 million for an arena to the $500 million, the billion-dollar price tag for the new expansion franchise without even hiring a body to man the operation is also a little intimidating for those who may not have an extra billion dollars laying around. What is surprising is that there were only two expansion bids submitted - Las Vegas and Quebec City. Markham, Ontario was interested in a second team in the Greater Toronto Area and is pushing for a new arena, but doesn't have one yet, didn't bid. Kansas City, who has the brand-new Sprint Center all ready to go, has no interested ownership groups at the $500 million price tag. Portland, Oregon doesn't have an arena for hockey thanks to Paul Allan controlling the Rose Garden. Milwaukee, Wisconsin is trying to fund a new arena for the NBA's Milwaukee Bucks and there was hope that it could house an NHL team, but that ludicrous price tag keeps owners from buying in. Of course, just because Las Vegas and Quebec City have submitted bids doesn't mean they're getting a team. There's still a long process to go through when it comes to putting a team on the ice, and we might be talking years down the road before either of these cities has a franchise awarded to it. What the NHL has done, though, is vetted the pretenders from the contenders when it comes to intention and financial backing. Those that were caught up in the dream of being an NHL city are realizing that this dream will require a lot of greenbacks before its realized as a team on the ice, and only two groups stepped forward with plans into which the NHL has to look. Quebecor, a massive media and telecommunications company in Quebec, will dry-run their new arena, the 18,259-seat Videotron Centre, on September 28 when the Montreal Canadiens host the Pittsburgh Penguins in an NHL preseason game. Being a media and telecommunications company, they would probably have the inside track on broadcast rights to any Quebec City-based team since they own it and the French-broadcasting rights through TVA Sports. In other words, this brings Quebecor to the forefront as a legitimate French broadcast partner, and we may see RDS pushed out of Quebec NHL broadcasts altogether if the NHL pursues a larger deal with Quebecor. Las Vegas has a ton of money, an arena going up, and a vast potential to earn dollars, but that potential has to be realized. Selling 13,500 seats for a deposit of less than half the price of one ticket, let alone the price of season tickets, just means there are a lot of people who have $50 to spend. While these people are on the hook to buy season tickets with the Las Vegas NHL franchise, there's no guarantee that all of them will follow through if and when the NHL awards a franchise to Sin City. After all, if the franchise isn't awarded until 2018, how many people will be in the same place they are no financially and personally in three years? Again, the idea of this bid is that it guarantees nothing other than the NHL knowing there is interest from a group in a specific city. Franchises will not be given out to anyone who antes up the money, and there is a process that the NHL will go through to ensure that not only are the parties ready for expansion, but the NHL is as well. As it stands, only two parties appear ready to take the next step if and when it is presented to them, and the NHL will need to make some decisions moving forward as to how they want to proceed. Make no mistake, though: the NHL is one step closer to having the Nordiques and Black Knights under their watch. It's not often I get an email from a player who wants to clear up some confusion that I have written or others have suggested, but I was going through my email and I figured I needed to write about this. The man to the left is Warren Skorodenski. He didn't have a long NHL career, but he has one distinction that puts him in the history books. The skull mask worn by Skorodenski was the first skull mask seen in hockey as he beat Gary "Bones" Bromley by a few years! While Skorodenski wasn't the first netminder in the NHL to wear it, Skorodenski debuted his skull mask in a different league, and may actually be responsible for the trend at that time! "This photo [Teebz: photo is below] was taken in the mid 70's at the Calgary Corral while playing with the Calgary Wranglers. Bones did not wear the Bones Mask until later on when Harrison made his different style mask and the Bones mask was born. And if that doesn't do it for ya just ask Greg Harrison who made my Harrison Skull Mask as well as the one for Bones. 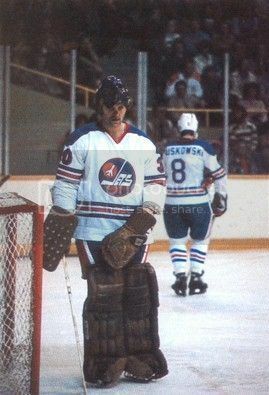 George Light from Selkirk, Manitoba made my 1st masks and the Skull Xray was painted by Norm Guziak in Winnipeg, Manitoba. I hope that clears up any misconception about the 1st Skull Mask." Clearly, there's a little fact-checking to do here, but I'm fairly certain Mr. Skorodenski is correct in his timeline. Adding to the awesomeness of Mr. Skorodenski's email is the fact that he's from Winnipeg, and it's always super-cool when a guy from my hometown is making hockey history. The image referenced above by Mr. Skorodenski is on the right of him playing in Calgary. That timeline would have him with the Wranglers in the WCHL and WHL from 1977 through 1980. We now have a timeline as to when Mr. Skorodenski wore the skull mask, and we can start piecing together a timeline as to who was first to wear the skull. Let's take a look back into history as to when Gary Bromley started wearing it. 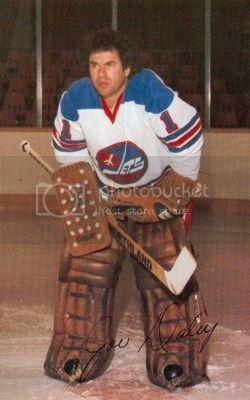 1977 saw Gary Bromley playing with the Winnipeg Jets in the WHA. Gary was fresh off a season with the WHA's Calgary Cowboys where he played 28 games behind Don McLeod. 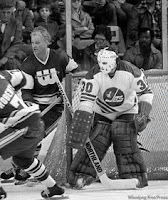 In Winnipeg, he split time with Joe Daley for the majority of the season, but his mask, as seen in the photo to the left, is completely white. The only problem? Mr. Skorodenski's photo of him in Calgary isn't dated. We must press on! As an aside, the Jets logo in the Bromley picture above is a little off from what I remember. See the jet in the logo? I don't recall it ever being white. 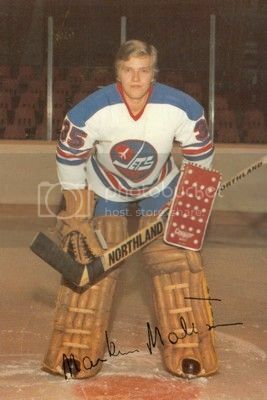 It's not shown on the 1977-78 image on whauniforms.com nor does it appear on any other year of the Jets' WHA existence. However, there are photos of Joe Daley and Markus Mattsson from the 1977 year that shows the white jet as well. Further to that, Gary Smith, who played for the Jets in the 1978-79 season, also wore a white jet in a game! Does anyone recall this white jet era for the Jets? How long did it last? And why was it changed when the Jets entered the NHL? Anyway, back to the task at hand. 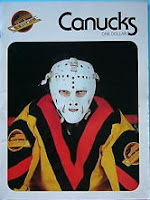 In 1978, the Canucks signed Bromley and it was in Vancouver where "Bones" debuted his mask to the world. The problem? He didn't start off with the skull mask in Vancouver, instead wearing a plain white mask like he did in Winnipeg as seen to the right. That program, compliments of an eBay search, is from November 3, 1978 meaning that Bromley wore his all-white mask while backing up Glen Hanlon for at least part of the season. In other words, Mr. Skorodenski has a two-season head start on Bromley when it comes to wearing the skull mask, and Mr. Skorodenski has named names when it comes to having witnesses on this. I'm going to say that there's a better-than-good chance Mr. Skorodenski is right at this point. Of course, Bromley was in the NHL two seasons before Mr. Skorodenski got there, and Bromley's hockey career ended in the AHL the season that Skorodenski played his first NHL game with the Blackhawks. 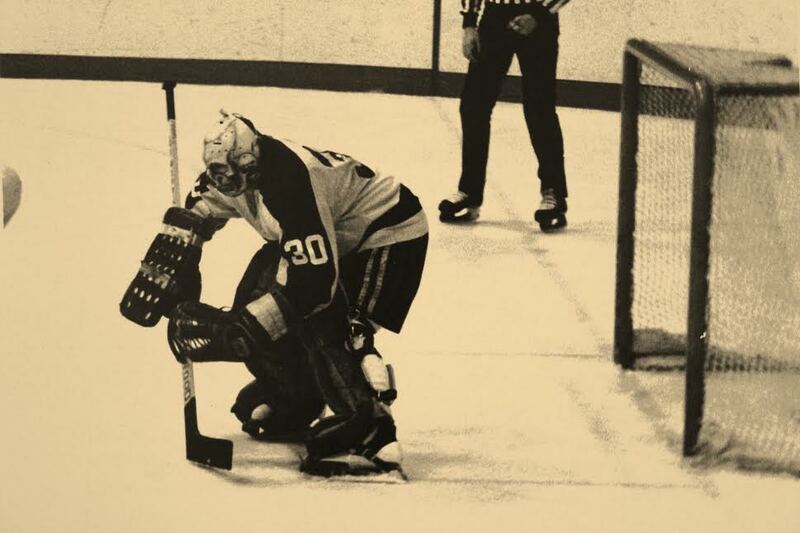 It seems logical to suggest that Bromley was the first goaltender to wear the skull mask in the NHL, but it seems that Mr. Skorodenski is entirely right in saying that he was the first to wear the design in a documented hockey game. Skorodenski wore it while in junior while Bromley didn't have it for at least a year and a half later while playing with the Canucks. "George Light in Selkirk Manitoba. George worked in the casting department at the Selkirk Mental Hospital. He made Glen Hanlon and Karl Friesen's masks as well. I use to tell people that as a joke, as it turned out I asked him what Hospital he worked at the last time we spoke a few years ago and he told me the Mental Hospital. I had to laugh and tell him my story. He had a good laugh as well. My last mask was a Harrison. Not sure if Bones had his skull mask first or not. All I know is my skull was painted in the late seventies when I played for the Wranglers and I didn't know who bones was until we played against each other in the AHL in the eighties. Bones did not play in Vancouver until 78-79. I had the skull Mask in Calgary playing junior when Bones was with the Cowboys and he wasn't wearing the Bones Mask then." 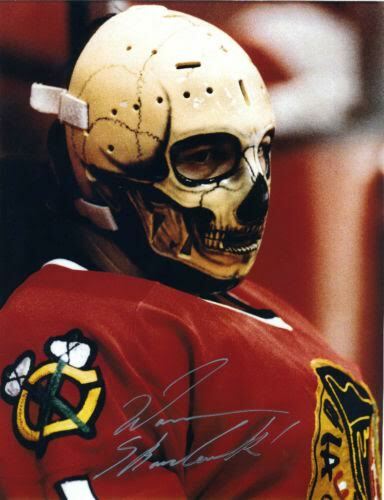 There you have it, folks: Skorodenski should be credited with the first skull mask in history while Bromley should be credited with the first skull mask in the NHL. While some may say that this distinction matters little, I know it matters a lot to the man who played just 35 career NHL games. After all, it's his legacy and mark on the game! My lord, are those spectacular shirts! As you're aware, Canada is the land of hockey and curling in the winter, and we have some pretty incredible athletes who represent the country on both fronts. While most wear the standard red and white with the occasional black shirt mixed in while representing Canada, there are a pile of designs seen at provincial tournaments and small tournaments. The ladies above? They may have set the new standard on how I judge curlers and their attire. 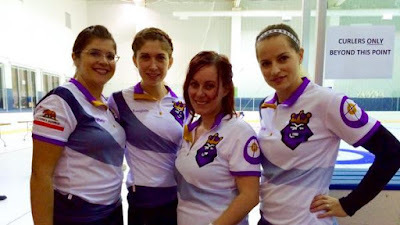 Compliments of @mariebuck on Twitter, the four ladies above are Liza Beres, Marie Buck, Cindy Wood, and Jennifer Gamboa of Hollywood Curling who partake in arena curling. Arena curling, unlike traditional curling, takes place in an ice hockey rink usually after people have been skating on it all day. Because of this fact, the pebbled ice that helps the rock curl nicely usually isn't present and is instead replaced by sometimes choppy and beat-up ice from skates. Generally, arena curling takes place where the availability of curling rinks is low. In reading that, arena curling has a definite cross-over appeal, and these four ladies are doing the Burger King proud! Being Canadian, I might get me one of these if I can find out where they were made. These shirts are awesome! UPDATE: Yahoo! 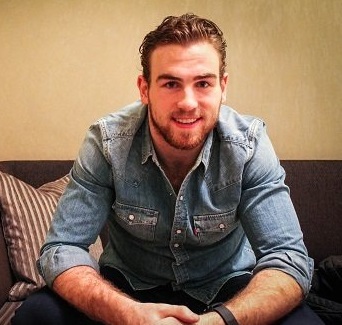 's Puck Daddy has an interview with the ladies! An NHL player has a lot to worry about on a day-to-day basis when it comes to being game-ready. Game-day meals and transportation to and from the arena always factor in, especially in when in foreign cities, but one needs to be aware that a lot of a hockey player's life is spent sleeping and traveling. Sleeping rejuvenates the body while traveling usually allows for additional rest but at odd hours. That being said, traveling presents an obvious problem when it comes to playing fresh versus playing tired. In recent cases, the Winnipeg Jets traveled an insane amount when they played in the Southeast Division, and there were always questions as to whether this amount of travel was having a negative impact on the standings. Teams that travel more are home less where the comforts of home are certainly appreciated, so there's always a question of how much travel is too much travel. On The Forecheck's Dirk Hoag has been calculating these totals for a few years now, and he's done it again this season. It should be noted that the Western Conference teams, as a rule, always travel more than most Eastern Conference teams which makes it harder to understand why the Western Conference teams continue to win Stanley Cups when there's a ton of travel involved. In any case, there are a couple of Eastern Conference teams who log a ton of miles as well, so we'll take a look at this starting with the chart below. As you can see, the San Jose Sharks travel the most, and the Pacific Division represents seven of the top-fifteen positions on the chart. You can see why the AHL is concerned about traveling for their new Pacific Division, especially since there are no teams in the Mountain Time Zone. While I'm not suggesting that an NHL Pacific Division team won't win the Stanley Cup, it does get a little more difficult to be fresh when the playoffs start after traveling that much during the season. The Metropolitan Division travels the least which should benefit the Rangers, Islanders, and Capitals in terms of being playoff teams. While the other five teams may not have a realistic shot at the Stanley Cup this season, having the shortest travel schedule means that only one team from the Metropolitan Division has a shot at the Stanley Cup thanks to the divisional playoffs. The Rangers have played in the Eastern Conference Final in the last two years - can they make it a third year in a row? I'm not sure if the NHL doesn't like the Buffalo Sabres and Columbus Blue Jackets, but those two teams have 19 back-to-back games this season. We've seen good teams post winning records on the second-half of back-to-back games, so the NHL might be testing the Blue Jackets after their improvements this off-season. As for Buffalo, there's always next season. The Maple Leafs and Penguins rank second and third, respectively, on the back-to-back game list with 18 and 17. Looks like Phil Kessel doesn't get a break in the back-to-back department with his trade. Honestly, you'd think that Eastern Conference teams would have it easier with less back-to-backs, but there are several Western Conference cities where back-to-backs are easier to pull off. One such place is Los Angeles and Anaheim. According to the data, "[t]he Los Angeles Kings will play a league-high 16 games 'rested' next season, benefitted by the fact that the Ducks skate just down the road in Anaheim" as per TSN. "Rested", in this case, means a night where the opposing team plays but the team in question is off. Back-to-backs appear to also be the case for Edmonton and Calgary games where they play as the home team, and Minnesota and Winnipeg are close enough to make that a back-to-back adventure for some squads as well. Just as a note, Nashville plays just four games while "rested". A reason for that? Read on. Detroit suffers the most this season being a "tired" team 14 times. For one of the older teams in the league, that's not what you want to hear. However, the Red Wings are slowly transitioning to a younger team, so there may be more opportunities for the kids to get in and play amongst the veterans. We'll have to see how head coach Jeff Blashill handles this hardship. The Tampa Bay Lightning, the defending Eastern Conference champions, will travel nearly 2500 more miles this season and will play three more back-to-back series than they did in 2014-15. For one of the younger teams in the NHL, this may not pose much of a problem, but tired players can lead to an increased number of injuries. We'll have to see if the Lightning can duplicate this past season. Nashville, who won the Central Division last season but fizzled in the playoffs, will travel nearly 5000 less miles this season. They will play one additional back-to-back series, but you have to think that one less cross-country flight will be good for the Predators as whole. While they showed some teeth against the Blackhawks in the playoffs, you'd think a fresher Predators team might make some noise this season. The Flames enjoyed one of the best travel schedules in the league last season, but their young legs will be tested with an increase of almost 10,000 miles this season. We'll see how that wear-and-tear goes for them this season. 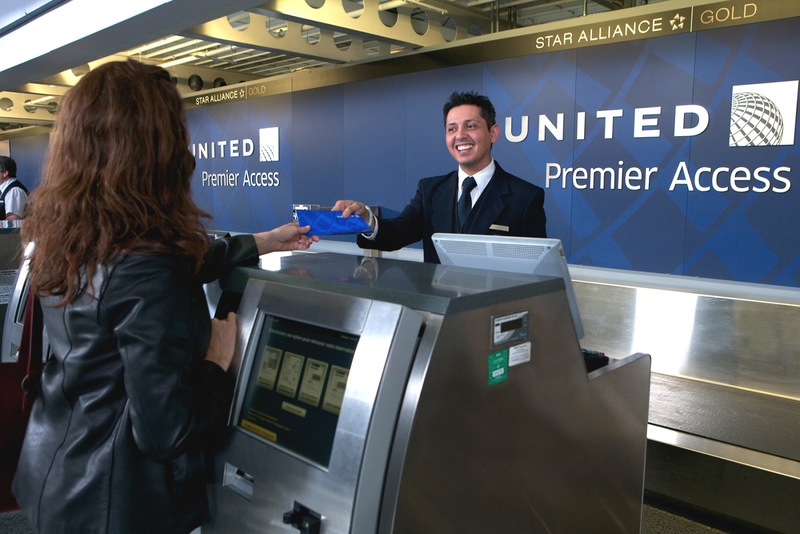 On the flip side, the Arizona Coyotes cut almost 10,000 miles off their travel this season. 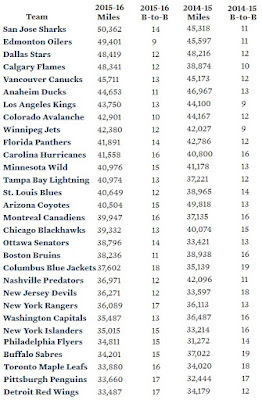 You wonder if the NHL is throwing them a bone in trying to make them profitable this season. I'm not suggesting that the NHL specifically schedules teams for less miles after playing a particularly grueling schedule the season before, but making the Coyotes a strong team financially makes for a stronger NHL overall. Clearly, there are a lot of quirks with the NHL schedules, but it's still 82 games for all teams. Chicago, for what it's worth, logged the 14th-most miles last season while playing the 11th-most back-to-back games at 15. Add in the fact that they were the visiting team in three of four playoff series that saw them go through Nashville, Minnesota, Anaheim, and Tampa Bay, and you have to wonder if the team that travels best is the team that wins the most. The Hockey Show, Canada's only campus-produced hockey radio show, is back with a rather unique show tonight as we're looking for your calls! That's right: it's a call-in show where you ask the questions! Beans and I will try to give answers as best we can on any and all hockey subjects brought up, and we're happy to talk all things hockey. No topic is off limits, everyone is welcome, and questions can range from the mundane to Dateline investigative journalism questions! One of the topics we'll be discussing is the new look of the Milwaukee Admirals who will visit Winnipeg a number of times this winter as a Moose divisional rival. The new logo, seen to the left, builds on the skeleton logo used in the past by Milwaukee, but that skeleton looks far less cartoonish now as it almost takes on a Jolly Roger look. The logo isn't bad, but the Moose were the only blue-on-blue team in the division until Milwaukee unveiled their new uniforms last night. I really loved Milwaukee's light blue uniforms, and according to the Admirals, "[t]he Ads will continue use of their third jersey from previous seasons that featured the popular full body logo. The only difference is the black in the full body logo is replaced with navy." At least all is not lost in this change. Do you want to talk about the Patrick Sharp trade? We can do that. Do you want to complain about your team not signing Player X? Call us. Have a beef with something Beans and I have discussed before? Rip us a new one. Your calls - good, bad, or indifferent - will be featured tonight on The Hockey Show, and I might go on a rant against Hockey Canada after they released their National Women's Development Camp roster today. I'm feeling like a good rant is needed. In saying that, the phones will be wide open and we we'll be awaiting you calls! Hit us up at 204-269-8636! Join us tonight on 101.5 UMFM on your radio dial in the Winnipeg region or you can listen live between 5:30pm and 6:30pm CT on your web-enabled device at the UMFM webpage! You can tweet me anytime you like by hitting me up at @TeebzHBIC on Twitter. You can also post some stuff to Facebook if you use the "Like" feature, and I always have crazy stuff posted there that doesn't make it to the blog or show. Your calls, my rant, and Beans and I talking hockey fashion The Hockey Show only on 101.5 UMFM! Antler Banter returns today, and it's hard to believe that the Moose have been in town for eleven weeks already! There hasn't been much noise out of Moose camp yet since these weekly updates have started, but there has been lots of AHL news to catch up on, and the Banter is all over it. If you haven't heard, the AHL broke out a bunch of rule changes this week, and we'll take a look at those individually. There were some player signings by a few teams, an AHL coach who is returning to his team, and a new coach for the same team as we work through this edition of Antler Banter. We'll also have some breaking news as one AHL team is debuting a new look today! It might be summer, but it's a busy day for the Banter, so let's get this going! The AHL released the regular season format, and there will be some changes compared to previous seasons in the AHL. The season will see 1120 games played between October 9 and April 17. All teams outside of the Pacific Division will play their normal 76 games each, but the newly-formed Pacific Division will see the five teams - Bakersfield, Ontario, San Diego, San Jose, and Stockton - play just 68 games each. While I understand that travel costs are always an issue for teams located two time zones away from everyone else, the AHL should have looked at moving the affiliates of the Arizona Coyotes and the Vancouver Canucks a little further west than Springfield, Massachusetts and Utica, New York to follow the NHL alignment. But who am I to think logically? According to the AHL release, "The top four teams in each division ranked by points percentage (points earned divided by points available) will qualify for the 2016 Calder Cup Playoffs, with one exception in each conference: if the fifth-place team in the Atlantic or Central Division finishes with a better points percentage than the fourth-place team in the North or Pacific Division, it would cross over and compete in the other division's bracket." Because each point in the seven-team Pacific Division is weighted more heavily than the rest of the league because they play less total games, wins and losses could be huge teams trying to make the playoffs down the stretch. For example, if the Manitoba Moose battle all season and finish in fifth-place in the Central Division with a 35-33-4-4 record, they'd have a points percentage of .513 and 78 points. However, if the San Jose Barracuda finish the season in fourth-place in the Pacific Division with a 30-30-4-4 record, they'd have a points percentage of .500 despite only having 68 points, and would miss the playoffs because the Moose have a better points percentage total. Increase that record to 31-29-4-4, and suddenly the Barracuda have a .515 point percentage and are in the playoffs. Each point in the Pacific Division weighs 0.0074 while the Central sees a weight of 0.0066. In other words, wins and losses mean more in the Pacific Division for those seven teams than it does for the Central Division. We'll see how this unfolds at the end of the season when that eight-game difference comes into play. The Calder Cup Playoffs will now start in a divisional format rather than their traditional conference seedings. The division semifinals - aka the first round - are best-of-five series while the remaining three rounds are best-of-seven series. That means you'll see more of the teams you like to hate as divisional foes will begin to etch out rivalries. Personally, I like this idea as a number of the old IHL nemeses - Chicago, Manitoba, Grand Rapids, and Milwaukee - will battle it out for Central Division supremacy once more! The overtime period moves to three-on-three action for the entire five minute period with teams changing ends at the start of overtime, meaning that the long change comes into effect. The "coach's challenge" becomes a thing in the AHL, and there are a few rules one must follow to initiate a coach's challenge to have a play video reviewed. First, there are only specific rules and situations that can be challenged that the AHL didn't specify, although I assume that will be made clear very shortly. Second, a coach must have a timeout available to be used and must initiate the challenge before play resumes after a stoppage. Third, if a team fails on its challenge, they will be charged a timeout. As an aside on these challenges, I can see this being done late in games when coaches want a longer-than-thirty-second timeout for a tired unit. Normally, video reviews last for a minute to a few minutes, so I can see a wily coach calling for a review so his players can catch their wind. I'm sure there will be something built into the rule where a challenge can't be made in the final minute or a variation of that, but expect coaches to try and blow open a loophole if they can. Finally, for all non-center ice face-offs, the defending player shall place his stick on the ice first. For face-offs occurring at center ice, the visiting player shall place his stick on the ice first. This was a suggestion made by NHL GMs, and it appears that the AHL will test it out to see how effective it is. Forward Matt Carey, formerly of Rockford, signed a standard player's contract with the Iowa Wild. Forward Oscar Lindberg re-signed with the Hartford Wolfpack. Forward Zach O'Brien, formerly of Manchester, will skate with Chicago Wolves this season instead of moving to Ontario. Forward Shane Prince re-signed with Ottawa and will most likely play with the Binghamton Senators this season. Center Brody Sutter re-signed with the Hurricanes and will likely skate this season with the Charlotte Checkers. Defenceman Alex Petrovic re-signed with Florida and will likely anchor the blue line in San Antonio once more. Winger Quinton Howden re-signed with Florida and will also appear for the Rampage this season. Winger John McFarland also re-signed with Florida and will most likely skate with the Rampage as well. Center Marc-Louis Aubry re-signed with the Detroit Red Wings and will most likely play with the Griffins this season. Defenceman Dylan McIlraith re-upped with the Rangers and will continue to hone his skills in Hartford. The Lehigh Valley Phantoms and Philadelphia Flyers announced on Monday that Scott Gordon will be the new head coach for the Phantoms. The 52 year-old joins the Flyers organization after serving as an assistant coach with the Toronto Maple Leafs for three seasons from 2011-2014. He was also the head coach for the New York Islanders for 181 games. Previous to his stint with the Islanders, Gordon served as the head coach with the Providence Bruins where he coached the Bruins to five Calder Cup Playoff berths in six seasons. "We are extremely pleased to add Scott to our organization as head coach of our top affiliate in the Lehigh Valley," said Flyers general manager Ron Hextall. "He brings in a proven track record of success and knowledge as a coach at all levels, and we are confident he can help develop our prospects through our system, as well as lead the Phantoms back to the Calder Cup Playoffs." Scott Gordon is an excellent head coach, and should make an impact with the Phantoms at the AHL level. The Phantoms and Flyers also announced that Riley Cote will return to the Phantoms as an assistant coach for the coming season under Gordon. The 33 year-old will enter his sixth season as an assistant coach with the Phantoms. His experience in winning a Calder Cup with the Phantoms in 2005 should once again prove invaluable for the younger players joining the Phantoms this season. The Winnipeg native also played in 156 NHL games with the Flyers. Always good to see a hometown kid doing well for himself! 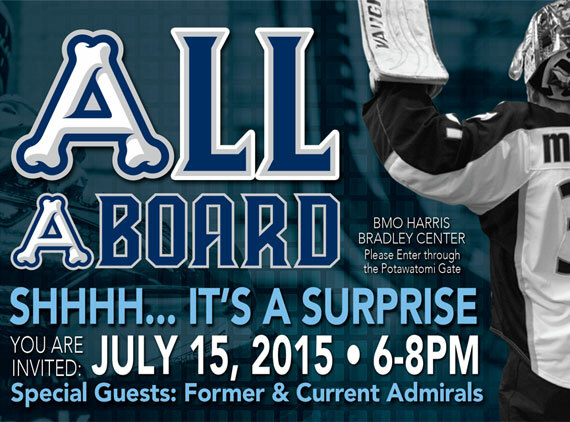 The Milwaukee Admirals will be bringing in a new look tonight at 6pm Milwaukee time! According to the release by the Admirals, "[t]here will be a fashion show to reveal the new jerseys and other merchandise, all of which will be available at the event" starting at 6:30 where the team will unveil the new jerseys and logo for the upcoming season. I can tell you right now that the bone font is alright, but the rest of the font with the funky angles and stuff doesn't fly for me. Personally, I liked the Admirals' set of jerseys they were wearing for the last few years, and I don't think they really need to change. What I suspect is that they'll look a lot more like Nashville, their NHL affiliate, with this change, and I don't approve of that. I like when minor-league teams have their own identities. That's all for tonight on this week's Antler Banter, but I'll be back with more next week as our looks into the AHL continue! With the cost to even submit an expansion application to the NHL at $2 million of non-refundable money out of the $10 million application fee that's needed, it's probably not in anyone's best interest to look at expansion with a looming $500 million price tag to follow if you're successful. In other words, it might be better to investigate an already-established franchise to see if it is for sale. 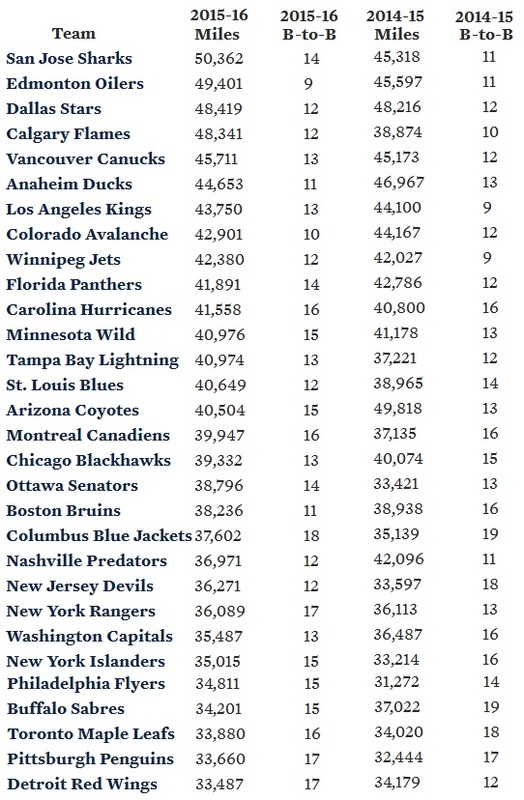 As of right now, there aren't many in the NHL that can be had, especially if one is looking for a successful franchise. It appears that the Pittsburgh Penguins, though, may be close to being sold after owners Mario Lemieux and Ron Burkle retained investment banking firm Morgan Stanley to look at selling some or all of their stake in the Penguins. "We conduct periodic reviews of our business and, because we have received several inquiries about the franchise in recent years, we decided to engage Morgan Stanley for their insight and counsel," Lemieux and Burkle said in a joint statement in early June. "After buying the team out of bankruptcy, ensuring its long-term future in Pittsburgh and creating a strong foundation for continued success, we believe it is time to explore our options." According to some, those options may include an $850 million price tag in a bid expected next week, turning a handsome profit after the two rescued the Penguins out of bankruptcy in 1999. Not a bad investment for a guy who couldn't get paid by the Penguins because of their bankruptcy. So while an expansion franchise would be nice for some investors, wouldn't the Penguins be more enticing? After all, they have a couple of world-class superstars in Sidney Crosby and Evgeni Malkin, some all-star contributors in Marc-Andre Fleury, Kris Letang, Chris Kunitz, Phil Kessel, and Patric Hornqvist, a new arena in the Consol Energy Center that has seen 377 consecutive home games sold out, and the land that the former Mellon Arena sat on awaiting development. Seems like that would be the wiser investment, no? Morgan Stanley was the same firm that helped negotiate the sale of the Buffalo Sabres to Terry Pegula in 2011 for $189 million, so it would appear that Lemieux and Burkle are due for a massive windfall in this sale. It sounds as though they may still retain a small piece of ownership in the Penguins while selling their controlling interest to a new party. After all, Lemieux's son, Austin, appears to be on the verge of making the 40-man roster cut with the USHL's Omaha Lancers if scouting reports are to be believed, and there's a chance he could play there this season. I'm pretty sure Papa Lemieux would like to take in a few of those games as well, and having to watch over the Penguins on a day-to-day basis may not allow for that freedom. According to Forbes' valuation of NHL franchises, the Penguins ranked in at a worth of $565 million, but both the NHL and the team feel that valuation is low. Even at a conservative $600 million, Lemieux and Burkle are looking at a massive profit. By retaining a portion of ownership, Lemieux has stated he would like to retain a title and position with the Penguins as well as having access to a luxury box at Consol Energy Center. Honestly, for a guy who saved the Penguins twice and has seen three Stanley Cups with the team, I don't think he has anything to worry about. Nevertheless, it's encouraging to see Lemieux wanting to be a part of the Penguins going forward. Reports have a potential offer being made next week for the Penguins. There could be a new owner in Pittsburgh sooner than we think. Ryan O'Reilly is a pretty solid player. He's scores goals, he plays hard, he backchecks fairly well, and he's pretty consistent. He's also the Buffalo Sabres highest-paid player in the history of their team after signing a new deal earlier this summer that will see him wear blue-and-yellow for the next seven years. While O'Reilly has signed a major deal with the Sabres after being traded by the Avalanche, I'm not sure how he'll look in Sabres' colors as I have yet to see him wear anything Sabres-related. But at some point, he wear the same colors as Perreault, Lafontaine, and Mogilny. Or possibly an orange jumpsuit. If you haven't heard the news yet, the Ontario Provincial Police have charged O'Reilly with DUI after he reportedly parked his green pickup truck inside a Tim Hortons restaurant. Yes, you read that correctly: not at a Tim Hortons, but rather INSIDE the restuarant. The OPP stated in a release today that they were dispatched to investigate a single motor vehicle crash where a "green Chevrolet pickup truck struck a commercial retail building and the occupants left the vehicle". The location of this crash was reportedly in a smaller town north of London, Ontario called Lucan. Seen below is the Tim Hortons restaurant in Lucan according to Google Maps' street view. I'm not going to downplay the fact that he's being charged with impaired driving because that's a pretty serious offence in its own right. However, leaving the scene of an accident only complicates the entire process and puts O'Reilly in serious trouble. The police also charged O'Reilly with care or control over 80 milligrams, meaning he had a blood alcohol concentration over 80mg per 100ml of blood. While there may be some argument as to how the officers were able to ascertain that reading, one must assume that they administered a breath sample to obtain this reading and charge O'Reilly with the offence. If he is found guilty of the care or control charge, a first-time offence will result in a $1000 fine and the suspension of driving privileges for one year. Needless to say, O'Reilly's in some hot water. 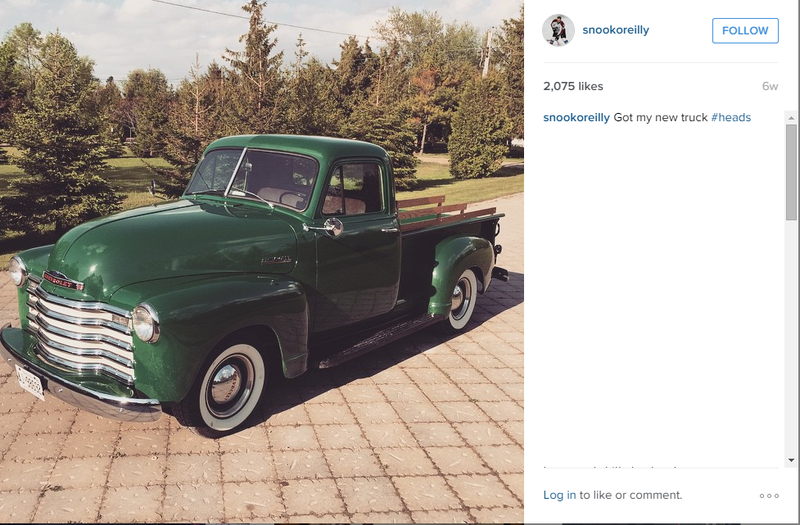 The sad part is that O'Reilly got himself a new green Chevrolet pickup truck just seven weeks ago as per his Instagram account. I have to admit that it looks great, and it's a shame that it was used to turn the interior of the Tim Hortons into a second drive-thru lane. The old Chevy is a beauty automobile, but it, like the Tim Hortons in Lucan, will most likely need extensive repairs to bring it back to its former glory. Thank goodness O'Reilly just signed a $52.5 million, signing-bonus heavy contract. He's gonna need some cash flow very shortly. Of course, O'Reilly is innocent until proven guilty in a court of law, and I'd be kidding myself if some sort of reduced sentence and community service aren't exchanged for leniency. We tell young people in this country that one night of stupidity can result in a lifetime of pain, and here is a 24 year-old man who has realized his dreams only to see them shattered in an evening of stupidity. Use your head, folks. No one wins when someone drinks and drives.